Rocket League has laid out its roadmap for Fall 2018 while delaying its long-awaited RocketID feature, in hopes that Sony will go a little further with its extended cross-platform idea. Rocket League is looking to expand in more ways than one in the months ahead. On Wednesday, the folks at Psyonix outlined what's ahead for the rocket-powered sports racing game by revealing its full Fall 2018 roadmap. Before revealing what's coming, Psyonix revealed what isn't coming in the next few months: RocketID. The RocketID was slated to release before the end of the year, but Psyonix hit the best kind of delay, with Sony's recent announcement of extended cross-play. Psyonix is looking to implement new changes to the upcoming RocketID feature, with the idea of full cross-play in mind. So far, PlayStation has only offered extended cross-play for Fortnite, so there's nothing guaranteed for any other game at the moment. 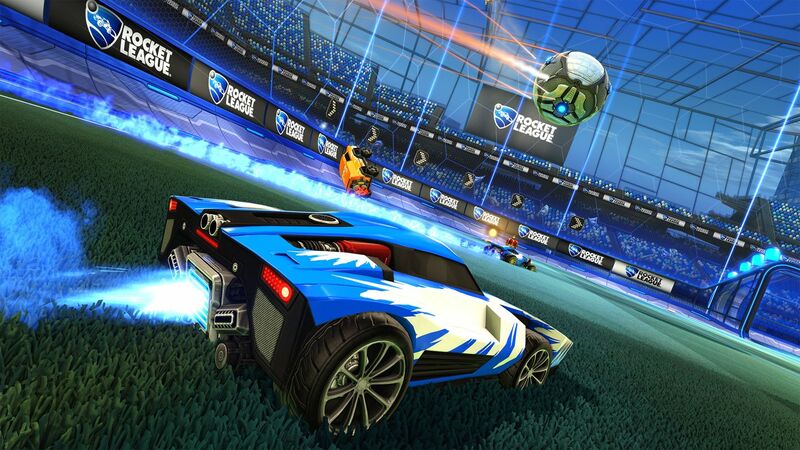 However, Psyonix has indicated that they will place a request for full cross-platform play with Sony. As for what is coming, a new update estimated for early December will look to add Xbox One X support for owners of Microsoft's console. This will include 4K resolution at 60fps, along with HDR support. The December update will also see the launch of Rocket Pass #2, offering a new lineup of premium DLC. More details on both the Xbox One X enhancements and the Rocket Pass #2 contents are expected in the near future. For more on what's coming to Rocket League this fall, including the holiday Frosty Fest event, visit the Rocket League website.